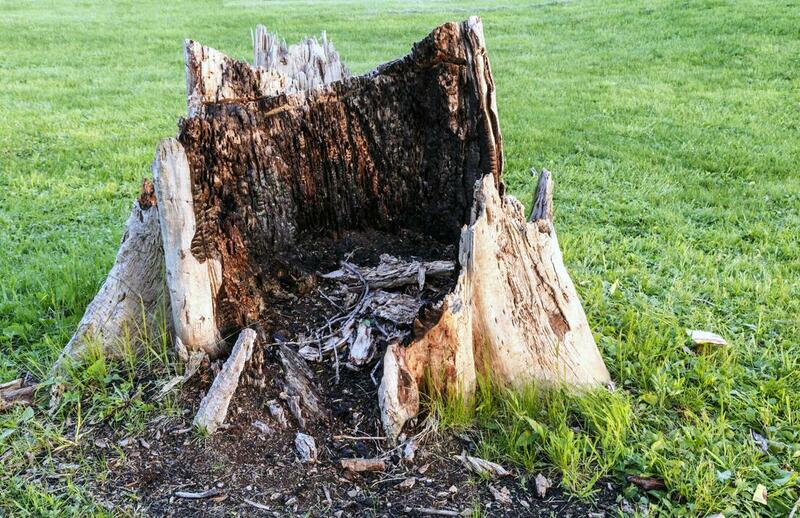 Stumps are often left behind when the tree has only been partially removed. Later down the line, clients may decide that they want a stump hauled away completely or would like to maintain grinding services that help it keep its short and clean appearance. Stump removal and grinding are done via our tree surgeon experts who understand best practices for removing a tree stump or grinding an existing stump to a certain height. Stump removal is often left at the preference of the client. Stump removal results in gaping holes left in the lawn that needs to be refilled over time and can be unsightly until they are filled. To avoid the mess of a large hole or multiple holes, many will remove the tree but leave behind the stump. Stump grinding uses a mechanical tool to shave the stump down to the desired shape. While we can’t make the decision for you, we’ll offer our best advice to ensure that you’re able to make an informed choice about removing a stump or to keep it in place. Should you decide to have a stump removed, stump removal can be performed by our licensed arborists. Stump removal is a process in itself that should be handled by professionals. Mishandling a stump removal project can severely damage your lawn and fail to remove the stump in one sitting. Using a mechanical winching tool, we grip the sides of the stump and remove it from the ground upward. We may also need to dig the sides of the stump before a sturdy grip can be made, which will increase the size of the hole that is left afterward. The roots of the stump should also be removed to make the area fruitful for new growth. Roots can be extracted using either a stump grinder, a solvent solution that breaks down the roots, or by digging them out with the rest of the stump. When a stump has been removed, you are likely left with a large hole where the stump once was. The holes can be dealt with in one of two ways: some don’t mind leaving the hole to fill itself naturally while others want the hole filled with new soil as soon as possible. We can also provide fertilization and grass seeds to promote new growth in the area but you should remain patient as this regrowth process can take a long while. Over time, the hole will naturally integrate with the rest of your lawn and the area will appear like new. Stump grinding machines are large tools that should only be operated by a certified arborist. Using the blade on the stump grinder, we go over the stump multiple times until it has reached your desired height. Stump grinding is done for maintenance purposes but also as well as preparation for removal. Before removal, the stump will be ground as low as possible, making it easier to extract and winch from the soil.